It’s been a cracking few days for sun. Possibly the sunniest March I can ever remember. Note to self – scoot back over the last 10 years archives and see if there’s a sunnier memory stashed away. I’ts fairly likely that the sun will dry up for a bit now due to the arrival of these – my new sunnies. They’re a bit brighter red than I was expecting but they are still super ace. 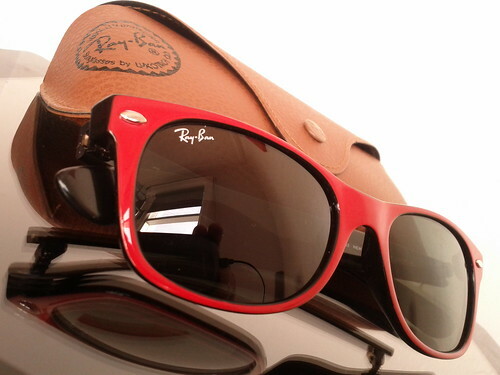 I’ve wanted a pair of Ray Ban’s since I tried on a friends pair last summer. Not especially for ‘the look’, even though these are officially design icons, as worn by anyone who’s ever been cool, and his cool dog for the last 70 years, but more for the quality of the actual glass lenses designed and optimised for the US Airforce. Putting ‘cheap’ sunnies on after trying Ray Ban’s on isn’t much fun. Vowed to get some. Got some. Hoping I manage to retain these without breaking them long enough to join me on a few sunny adventures.